IT’S hard not to be impressed by the sheer chutzpah of deciding you’re going to play Shakespeare’s greatest (and longest) role, forming a theatre company to allow you to do it, losing three stone in weight and learning the 1,422 lines that make up the Bard’s Hamlet. But that’s just what Edgar Phillips has done, and in convincingly boisterous physical style. 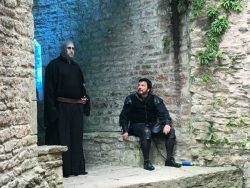 Wells Theatre Company makes its debut this week with Neil Howiantz directing what they describe as “the original dysfunctional family drama” in the grounds and the undercroft of Wells Bishop’s Palace, where Mr Phillips has his stained glass workshop. 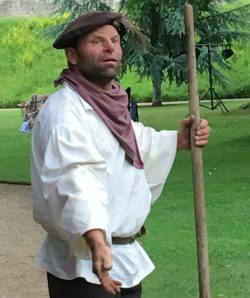 Many well known local actors have been tempted to take on this familiar and supremely challenging play, which, had the weather gods been kind on the opening night, would have been performed mostly in the open air. The opening scenes were played in the gardens of the palace, with the audience following the action as the royals processed, the ghost appeared on the battlements and the plots began. It was into the undercroft for the central “play within a play” that pricks the conscience of the king, and there the audience stayed, as heavy rain made the outdoor staging just too slippery to use. Hamlet, a vigorous boyo of a prince, just can’t get his head round his father’s death and his mother’s almost immediate remarriage to his uncle. He tries to joke himself out of it, but to no avail. When his mate Horatio sees a ghost in the castle, his worst fears are confirmed. It was murder, most foul. 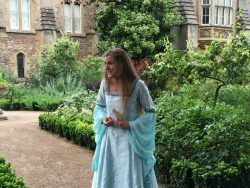 While his mother Gertrude (the excellent Karen Trevis) tries to convince herself that she doesn’t know the facts of her late husband’s death, the new king Claudius plots to have his nephew removed from the Court. Hamlet’s girlfriend Ophelia doesn’t know if she’s coming or going. Her beloved brother goes off to study and Hamlet, who has professed love for her, is by turns distracted and angrily indifferent. It can only end badly. There are some extraordinary performances in this production, from actors previously known for their light comedy roles as well as those who have a more serious thespian CV. Hamlet gives us more well-known phrases than any other Shake­spearean play, as well as speeches so familiar that they are hard to bring off without cliche. The Wells Theatre Company does it with huge panache. Susie Tookey makes the mad scene truly moving, as is Hamlet’s death. 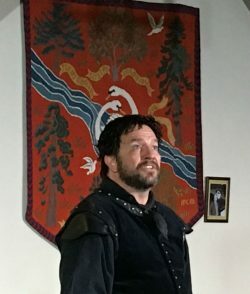 Rob Prince gives the performance of his life as Laertes, with Mark Wall providing a memorable grave digger and moving the audience around to the next location. Phil Turley mixes lust with fear as the murderous Claudius, and Neil Howiantz multi-tasks as Polonius. 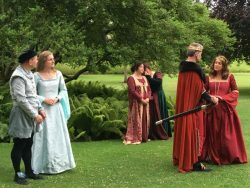 The whole thing is accompanied by an excellent six strong instrumental ensemble, adding to the atmosphere of the proceedings. This is not just an impressive debut, but an insightful, energetic, inventive and illuminating performance of the play that many consider to be the finest in the English language. Performances continue on Friday 30th June and Sunday 2nd July. Posted in Reviews on 30 June, 2017 .